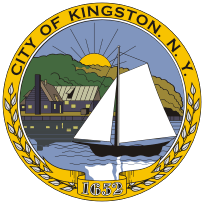 In 1777, Kingston became the first capital of New York. During the summer of 1777, when the New York State constitution was written, New York City was occupied by British troops and Albany (then the second largest settlement in New York and capital of the newly independent State of New York) was under threat of attack by the British. 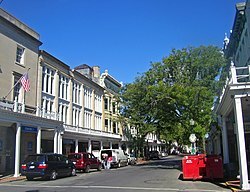 The seat of government was moved to Kingston, which was deemed safer. However, the British never reached Albany, having been stopped at Saratoga, but they did reach Kingston. On October 13, 1777, the city was burned by British troops moving up river from New York City, and disembarking at the mouth of the Rondout Creek at "Ponckhockie". The denizens of Kingston knew of the oncoming fleet. By the time the British arrived, the residents and government officials had removed to Hurley, New York. The area was a major granary for the colonies at the time, so the British burned large amounts of wheat and all but one or two of the buildings. Kingston celebrates and re-enacts the 1777 burning of the city by the British every other year (2019 is the next "burning" of Kingston), in a citywide theatrical staging of the event that begins at the Rondout. St. Joseph's Parish began in 1863 as a one-room mission school to serve the children of the Wilbur area, founded by Father Felix Farrelly, pastor of St. Mary's Parish in Rondout. The building was later sold to the city of Kingston in 1871. The frame building on the Bowery was turned into a schoolhouse. This was replaced in 1905 with the acquisition of the former mansion of Judge Alton B. Parker at 1 Pearl Street for a new St. Joseph's School and Convent. The Fair Street school building continued to be used as the parish hall until the property was sold in 1911. Also in 1911 a site for a larger school and convent was secured and 1 Pearl Street was sold. In 1943 the Sisters of St. Ursula replaced the Sisters of Charity at the school. Kingston has three recognized area neighborhoods. The Uptown Stockade Area, The Midtown Area, and The Downtown Waterfront Area. The Uptown Stockade District was the first capital of New York State. Meanwhile, the Midtown area is known for its early 20th century industries and is home to the Ulster Performing Arts Center and the historic City Hall building. The downtown area, once the village of Rondout and now the Rondout-West Strand Historic District, borders the Rondout Creek and includes a recently redeveloped waterfront. The creek empties into the Hudson River through a large, protected tidal area which was the terminus of the Delaware and Hudson Canal, built to haul coal from Pennsylvania to New York City. The Rondout neighborhood is known for its artists' community and its numerous art galleries; in 2007 Business Week online named it as among "America's best places for artists." It is also the site of a number of festivals, including the Kingston Jazz Festival and the Artists Soapbox Derby. While the Uptown area is noted for its "antique" feeling, the overhangs attached to buildings along Wall and North Front streets were added to historic buildings in the late 1970s and are not authentically part of the 19th century Victorian architecture. The historic covered storefront walks, known as the Pike Plan, were recently reinforced and modernized with skylights. In the Stockade district of Uptown, many 17th century stone buildings remain. Among these is the Senate House, which was built in the 1670s and was used as the state capitol during the revolution. Many of these old buildings were burned by the British Oct. 17, 1777, and restored later. A controversial restoration of 1970s-era canopies was marred by the sudden appearance of painted red goats on planters just prior to the neighborhood's rededication. This part of the city is also the location of the Ulster County Office Building. According to the United States Census Bureau, the city has a total area of 8.6 square miles (22.4 km2), of which 7.3 square miles (19.0 km2) is land and 1.3 square miles (3.4 km2), or 15.03%, is water. The city is on the west bank of the Hudson River. 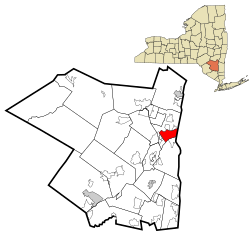 Neighboring towns include Hurley, Saugerties, Rhinebeck, and Red Hook. As of the 2010 census, there were 23,887 people, 9,844 households, and 5,498 families residing in the city. The population density was 3,189.5 persons per square mile (1,232.2/km2). There were 10,637 housing units at an average density of 1,446.4 houses per square mile (558.8/km2). The racial makeup of the city was 73.2% White, 14.6% Black or African American, 0.50% Native American, 1.80% Asian, 1.90% from other races, and 5.00% from two or more races. Hispanic or Latino of any race were 13.4% of the population. The median income for a household in the city was $31,594, and the median income for a family was $41,806. Males had a median income of $31,634 versus $25,364 for females. The per capita income for the city was $18,662, with 12.4% of families and 15.8% of the population below the poverty line, including 23.5% of those under age 18 and 10.3% of those age 65 or over. Kingston Stockade FC is the men's semi-professional soccer club based in Kingston, which competes in the National Premier Soccer League (NPSL) in the 4th division of the US soccer pyramid. Kingston Stockade FC play their home games at Dietz Stadium. In 1921, one time major league player Dutch Schirick organized a semi-professional team, the Colonels, in Kingston, New York. Major league teams would, on occasion, play exhibition games against the Kingston Colonels, and would sometimes recruit local talent. Bud Culloton became a pitcher for the Pittsburgh Pirates. Most students at John A. Coleman Catholic High School reside within the Kingston city school district. Commuter service is available by bus to New York City daily via Trailways of New York. The 90 mile trip takes roughly two hours by motor coach. Passenger railroad service to Kingston itself has been discontinued for several decades. However, about 11 miles (20 km) away is the Rhinecliff-Kingston Amtrak station, and 17 miles (30 km) away is the Poughkeepsie Amtrak/Metro-North station. CSX Transportation operates freight rail service through Kingston on the River Line Subdivision. There is also a small rail yard of about 7 tracks in Kingston. The Kingston-Rhinecliff Bridge, carrying New York State Route 199, is the nearest bridge traversing the Hudson River at 4.32 miles (6.95 km) to the north. U.S. Highway 9W runs north-south through the city. The New York State Thruway, also known at this section as Interstate 87, runs through the western part of the city. City bus service is provided by the city-owned CitiBus system (headquarters at 420 Broadway), while service to points elsewhere in Ulster County is provided by Ulster County Area Transit (UCAT). Route A travels between Kingston Plaza and Riverfront, B between Albany Avenue and Fairview Avenue, and C between Golden Hill and Port Ewen. On the first Saturday of every month an "art bus" is available for a fare of $1. The bus, usually a CitiBus tourist trolley, takes passengers on a guided tour of the art galleries of Kingston. Kingston's art galleries all have openings on the first Saturday of the month. Weekend water taxi service between Kingston and Rhinecliff, New York is available May through October for $10 round-trip. Some trips stop at the Rondout Light; a tour is available for an additional $5. Kingston historically was an important transportation center for the region. The Hudson River, Rondout Creek and Delaware and Hudson Canal were important commercial waterways. At one time, Kingston was served by four railroad companies and two trolley lines. Kingston was designated as a New York State Heritage Area with a transportation theme and the Hudson River Maritime Museum and Trolley Museum of New York are located on the waterfront. Also, the Catskill Mountain Railroad, a scenic railroad company, runs trains from Kingston on the former Ulster and Delaware right of way. 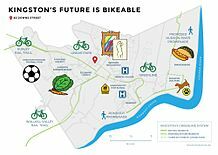 A map of Kingston's biggest attractions mashed up with proposed bike lanes, complete streets connections and rail trails. As of 2016, over a dozen separate ongoing projects were being coordinated between the Kingston Land Trust, Kingston City Government and Ulster County Government, connecting all three of Kingston's neighborhoods with a combination of rail trails, bike lanes and Complete Streets connections. HealthAlliance is part of the Westchester Medical Center Health Network, a 10-hospital, 1,700-bed Hudson Valley-wide healthcare system. ^ "2016 U.S. Gazetteer Files". United States Census Bureau. https://www2.census.gov/geo/docs/maps-data/data/gazetteer/2016_Gazetteer/2016_gaz_place_36.txt. Retrieved Jul 5, 2017. ^ "Burning of Kingston". New York Packet. 23 October 1777. http://www.historycarper.com/1777/10/23/burning-of-kingston/. Retrieved 2014-08-06. ^ "Close Of The Ice Harvest. ; Nearly All The Houses Filled--The Largest Crop Ever Gathered". The New York Times. 1881-01-25. https://query.nytimes.com/gst/abstract.html?res=9C0CE6DB1F3AE533A25756C2A9679C94609FD7CF. Retrieved 2010-05-07. ^ "Ulster Landing and East Kingston". brickcollecting.com. http://brickcollecting.com/shultz.htm. ^ Rob Yasinsac. "Hudson Valley Ruins: East Kingston - Hudson Cement Company and Shultz Brick Yard by Rob Yasinsac". hudsonvalleyruins.org. http://www.hudsonvalleyruins.org/yasinsac/ulster/ekingston.html. ^ Confessore, Nicholas; Barbaro, Michael (2011-06-25). "New York Clerks' Offices Gird for Influx of Gay Couples". The New York Times. https://www.nytimes.com/2011/06/26/nyregion/new-york-clerks-offices-gird-for-influx-of-gay-couples.html. ^ a b c "Our History". http://saintjosephkingston.org/our-history. Retrieved 29 May 2016. ^ "St. Joseph Catholic School". St. Joseph Catholic School. http://www.saintjosephschoolkingston.com/#!history/c1yr1. Retrieved 29 May 2016. ^ "Hudson River Maritime Museum". Archived from the original on 2008-01-08. https://web.archive.org/web/20080108162110/http://www.hrmm.org/rondout/rondout.htm. ^ Roney, Maya (February 26, 2007). "Bohemian Today, High-Rent Tomorrow". Bloomberg Business (formerly Business Week). bloomberg.com. https://www.bloomberg.com/amp/news/articles/2007-02-26/bohemian-today-high-rent-tomorrowbusinessweek-business-news-stock-market-and-financial-advice. Retrieved 2017-07-01. ^ "Kingston, NY: Profile". Forbes. Forbes.com. Retrieved 2017-07-01. ^ Leonard, DB (November 23, 2011). "DB Leonard commentary: Goats go viral". Kingston Times. Ulster Publishing. http://www.kingstonx.com/2011/11/23/db-leonard-commentary-goats-go-viral/. Retrieved November 27, 2011. ^ Horrigan, Jeremiah. "Steve Noble takes Kingston's top prize". recordonline. Dow Jones Local Media Group. http://www.recordonline.com/apps/pbcs.dll/article?AID=/20111109/NEWS/111090357/-1/SITEMAP. Retrieved 17 November 2011. ^ "Traveler's Information". Ulster County. http://www.ulstertourism.info/travlersinfo.html#transport. ^ "Archived copy". 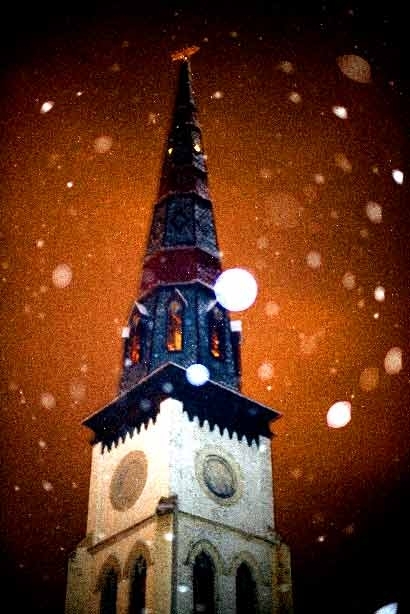 Archived from the original on 2013-12-13. https://web.archive.org/web/20131213012425/http://www.kingston-ny.gov/content/76/78/787/default.aspx. Retrieved 2013-12-08. ^ "Kingston-Rhinecliff water taxi launches today". DailyFreeman.com. http://www.dailyfreeman.com/articles/2009/05/01/news/doc49fa786b5bf21123589390.txt?viewmode=fullstory. ^ "The Lark: Hudson River Water Taxi". HudsonRiverCruises.com. http://www.hudsonrivercruises.com/hudson-river-water-taxi.htm. ^ a b "5 New Reasons Why You Should Move to Midtown Kingston Right Now - Kingston Creative" (in en-US). 2016-04-29. http://kingstoncreative.net/5-new-reasons-move-midtown-kingston-right-now/. ^ "NORTHERN DUTCHESS HOSPITAL". https://www.healthquest.org/rhinebeck/northern-dutchess-hospital.aspx?#124;Service%20Lines. ^ "Meet Us - joseph heavey". https://www.childrensmedgroup.com/meet-us/joseph-heavey/. ^ "Ulster Radiation Oncology". https://doctor.webmd.com/practice/ulster-radiation-oncology-85b31dc8-4703-e211-a42b-001f29e3eb44-overview. Wikivoyage has a travel guide for Kingston (New York). This page uses content from the English language Wikipedia. The original content was at Kingston, New York. The list of authors can be seen in the page history. As with this Familypedia wiki, the content of Wikipedia is available under the Creative Commons License.